Yesterday I went to the doctor. No, I’m not sick. I went to have some blood work done. You know, test the cholesterol level, thyroid level, and whatever else kind of test they are supposed to do, on, you know, “middle aged” people. I haven’t been to the doctor in quite some time, and I didn’t even HAVE a regular doctor. For the past 15 years, while I was in childbearing mode, my ob/gyn or the midwives were my doctors. I’ve gone to the midwives a couple of times in the last 5 years for the basic “yearly” check up and stuff, but honestly, now that I’m not having kids and don’t plan on having any more kids, I don’t especially enjoy hanging out in the waiting room with all those pregnant women. So, I made an appointment with a new doctor, but ended up not even seeing that doctor, I saw the nurse practitioner instead. As she was asking me what I was in for, and I said I just wanted some blood work done, she looked at me with a quizzical look. “Any symptoms?” Um, no, not really. I feel ok. “So, you’re perfectly healthy?” she asked me. Perfectly healthy? Well, of course not! I’m obviously overweight, but must we bring that up? I’m thinking. And I have this here stupid broken toe, but I’ve already suffered for four weeks with that thing, so it seems a little bit late to bring that thing up. “That’s very proactive of you,” she said. What is this? Am I the only person who ever comes in for a “check-up”? I mean, this is pretty new for me, too, but must you make me feel so odd for coming in? She finally sent me to the phlebotomist, who, no surprise, really had to stab and poke and check the other arm, then DIG around in there to get a vein. I am NOT an easy stick. But she Did get a vein, and got enough blood to do the necessary tests. As I was leaving, I stopped by the payment desk, and asked about Cole’s bill. I brought him in about a month ago with a different doctor in the practice for some x-rays and then some mole removal, and I haven’t received a bill. She looked him up, and said, “It looks like there’s a zero balance. Your insurance must have covered it.” Hooray! We’ve met our high deductible! Thank you vein surgery. I was just curious, so I asked her to look up how much those visits were. Over $500, and we don’t have to pay ANY of it. Ha, ha, ha, ha, ha! So we have to do ALL our routine doctor visits between now and the beginning of the year. Flu shots, physicals, mole removals, bring it on. Because come January, we’re NOT going to the doctor again. I’m so glad you had a fun time on your mountain biking trip to Moab with the scouts. I’m very glad you have great leaders who love you boys and are willing to take whole groups of sweaty boys on long drives. I just have one small request; in the future, could you please not just dump all your dirty laundry out in the laundry room? Since your clothes were covered in red dirt, perhaps a more appropriate place to empty out your duffel bag would be, oh I don’t know, OUTSIDE, perhaps? Let’s try to keep these things in mind the next time you go on a scout trip. If there is a next time. 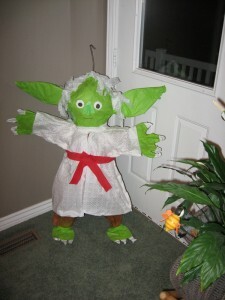 Remember John’s fabulous Yoda Pinata? Of course you do. Who could forget? Well, I just wanted to give a shout out to the fabulous pinata makers at Happy Pinata, who made that for us. Check it out–they make all kinds of pinata, even custom pinatas, for $20 or less! They are based here in Utah county, so that wouldn’t really help you if you are in Wisconsin, but for you locals, you can call them at 801-794-2110 OR 801-472-1221 or just go to their website, www.happypinata.com. I’m going to remember this the next time some demanding child of mine asks for some outrageous jar jar binks pinata, or a Buzz lightyear pinata, or a Brats pinata, or an American girl Kit pinata or some other silly specific thing. Hopefully this knowledge can save one or more of you a lot of stress when planning your next birthday party. Yesterday was kind of a difficult day. Tuesdays are generally so packed it’s hard to get everything done, anyway, but it was especially discouraging. I had planned to go to the temple as soon as John was out the door. He’s only away at school for about 3 1/2 hours, so if I’m going to leave home and get anything done, I really have to plan it out well. I showered, got dressed up in a skirt, got my temple things to the car, and then checked to see if my recommend was in the pocket of my bag like it usually is. Not there. Well, maybe I left it in my wallet. Nope. My purse? Nope. My church bag? Not there, either. I looked and looked everywhere I could think that it would be, all the logical places I may have put it. Not finding it. It’s our stake temple week, and our Stake President has asked us to be in the temple as much as possible this week, and honestly, as much as possible for me meant one morning and one evening. That is really about all I can fit in. And there I was, blowing my one morning. After futilely looking for about a half hour, I decided to just bag it and go to the grocery store. I hadn’t bought milk or bread for my family for quite some time, and we were down to a few tablespoons of milk left, and NO bread. And I don’t really like to take mr. John with me grocery shopping, since he’s currently suffering from a nasty case of the “I want that”s. So, off to the grocery store I went, where I didn’t walk out of there with a free cart of food or anything, but I did manage to get pay only $100 instead of the $160 it first rang up as. 2:40–Jenna and Natalie come home. I get them a snack and ask about their day, while we gather up the piano books. 2:50–We pile into the car to take them to piano lessons. Then I run and return library books before coming home. 4:00–pick up Jenna and Natalie from their lessons. 4:30. On the way, I called Megan at home to make sure she was getting ready for her soccer game. Once at the soccer field, she bounced off to warm up with her team, and I set up my spot. I had my chair, my purse, my book, a drink and a salad. I was set. I sat in the sun and just soaked in the warmth. And the quiet. For two hours, I didn’t have to go anywhere, didn’t have to fix anything, do anything, or break up any fights. I was there to enjoy the soccer experience. It was heavenly. Not all soccer games are heavenly, I must say. The vast majority of them are either too hot, too cold, windy, rainy or snowy, or there are just too many kids there to actually watch the game. I read my book while they warmed up, and then when the game started, I ate my salad and drank my diet coke. And cheered on my daughter and her team. Go strikers! It was fun. It was just the moment I needed after the afternoon I had had. And I felt myself relax. 7:00, the game was just ending, it was starting to get cold, and we had to move on to our next activity. Megan’s team won. Great job. 7:10, I dropped off a teammate, then Megan and I went directly to the church where her Young Women’s group was throwing a baby shower for one of her leaders. This lady and her husband are soon leaving to a foreign country to pick up their two babies. They don’t have any other kids. They need everything x 2. It was a fun shower. So many people came and gave her baby stuff–some new, some used (she had asked for used, as she doesn’t want to burden people), and I could tell it was slightly overwhelming to her. She is very loved, and we all hope it goes well with these two little kids. I was hoping that while I was there at the church, I could meet with a member of the bishopric to get my recommend. No. They were all at a regional meeting. Darn. But I had a good time socializing with neighbors and friends to celebrate the growing of this little family. 9:00-Megan and I came home. She was very hungry and wanted some kind of food, but of course NOT the dinner I had made for the family. I think she ate two pieces of toast. 9:30–I told the kids to turn out their lights, and I climbed into bed myself. 9:50–The phone rang. It was a member of the bishopric calling because his wife had told him about my dilemma. He offered to meet me at 8 the next morning to get me a new recommend. So, maybe I will get to accomplish some of the things I had planned for his week afterall. Either I need to start being productive earlier, or they need to stay at school longer. I’m just sayin. The other day I realized that we needed to once again switch up the bedrooms. Ugh. I thought the last time we shifted bedrooms, which I think was about two years ago, that would be the last time. But when you have five kids and three bedrooms to put them in, there tends to be a lot of shifting going on. It wouldn’t be fair to let one child continually have their own room, so there is much sharing. Sadly, the basement is not finished yet, and our son continues to grow. It came to my attention that Cole, my nearly 16 year old son who is now taller than me, does not fit very well in the top bunk of the bunkbed we bought for him when he was 4. He can’t be sleeping that well up there, and although I don’t think it’s a bad thing to share a room with your little brother, he’s been very good to share for the past couple of years. I guess it’s time he gets his own room again. On Friday I announced to the kids that we would be changing roommates, and that everyone would need to help out to perform the shift. Megan, who has had the biggest room and the biggest bed, which doubles as the guest room, will no longer have the room to herself. The bunk beds will be going in there, as will Natalie. John will then go into the room with Jenna, and Cole will stay in the same room, but he will get the queen bed again, and no roommate. BUT, there is the stipulations that he keep his room CLEAN, as when guests come, as they frequently do, he will vacate the room and sleep on the couch bed in the unfinished basement. So Friday night, before we all went to our parties, activities and concerts, Megan and Cole switched beds. Dad helped take the bunkbed apart, but they did most of the hauling. We stripped the beds, threw that bedding in the wash, and started pulling out new bedding (boy type bedding for the queen bed, and girl AND boy type bedding for the bunk beds). We can move everyone’s clothes, books, toys and other crap later, but I wanted to at least get the beds situated. Saturday I told the kids to go ahead and start moving their stuff, and I took Natalie to a volleyball game. When I came home, I saw that the entire hall was full of stuff. Look, there’s John’s dresser, and his toys, and a pile of books, and piles of bedding. *Sigh* As long as we can get past, I can deal with it. I left again to go to a baby shower for my dear friend, Maranda, and asked them to please continue to work on their rooms, and don’t spare the garbage bags! I came home to find all the kids down in the basement playing wii and other games with Cole’s friend Sam, who had come to spend the day with us. Nothing more had been done. Off I went to a soccer game for Megan. I ended up sitting in the shade of a tree back by the goal instead of the usual parent place on the sideline, and I was completely happy there. I spent almost the whole game time (about an hour and a half) talking to my sister about their whirlwind trip across the country with all ten kids in the van. I really should blog about THAT, shouldn’t I? Can you imagine taking 10 kids on a 7 week roadtrip? Well, neither can I, and I only have 5 kids, but that’s another story for another day. After the game, we came back home, to see that of course NOTHING had been done on the rooms. Ryan had been outside mowing the lawn, and the kids were just playing. Oh, well. I don’t have the energy to go through the piles and piles of stuff, and move dressers, closets and bookshelves right now (maybe not ever), so I’ll just let it stay that way. For now. Before bed, I did actually go into the room that will be shared by Jenna and John and threw away two garbage bags full of stuff. I also sorted a bunch of John’s toys so that he can have a bin for star wars guys, a bin for cars, and a bin for dinosaurs, but I don’t know how long they will STAY in their assigned bins. I’m hoping that Monday I’ll wake up bright and early with a BURST of energy and enthusiasm and be able to tackle at least one room. And when they get home (Monday’s early out day) I’ll put them to work at sorting, organizing, and moving, so that someday soon we can get the dressers out of the hall. I’m sure it will take at least a week. So, if you don’t hear from me for a while, you might want to check under one of the piles. Just in case I fall and hit my head and no body can find me for days and days. Wish us luck. Yesterday, John was talking about the “Freeze tag championships” and that his friends would be coming over after school for this important event. Um, okay. So, after school, we called a few of his friends and invited them over. One of the moms said, “Oh, yes, the freeze tag championships! My son told me all about it.” The other moms know about this? Once he had three friends over, I guess that was enough, because they all went outside to play. I don’t know if there was any freezing going on, but they had a good time. Natalie is starting up volleyball. I’m so glad I have a friend who is willing to coach our daughters on their team. I asked Natalie how it went at practice, and she said, “I am definitely one of the best servers on the team!” I am glad she’s so excited about it. Megan is full on into fall soccer, and they’ve had some good wins and some other not so good not wins. But even when they don’t win, it’s soccer and she loves it. She’s also been playing YW volleyball, Co-ed Dodge ball at church, and Flag football at school. She came home excited because her team, the Cheez-it’s, won the championship against teams with such names as Step Rebok, Fluffy Green of Sheep, No-names, Hello Kitty Bandaids, and the Terrific Touchdowners. Tonight is John’s last soccer game. His little team has dominated the pre-K/Kindergarten division. I’m not sure why, but his team is bigger than all the other teams, and they have been doing great, winning all their games. The other coaches look at our team and say, “Are you SURE these are first graders?” Yes, we are sure they aren’t first graders, although quite a few of them, like John, have late birthdays so they are already turning 6. It’s been fun for them to all have a chance to score goals. John says tonight is “his championship game” and he’s very excited about it. I guess it goes to show that you don’t have to be athletic to have sporty kids. I never would have thought I would have so many kids involved in so many sports. I remember playing YW basketball, softball and volleyball, but that was only so that we’d have enough people NOT to forfeit. I guess I was like the stand-in guy. I go and stand in for the real players so they could have a break. Yep, that was the extent of my athletic ability. And here I’ve got kids who not only play sports, but excel at sports, and love it. I’m glad that there are opportunities for them to play, and that we’ve been blessed to be able to put them in these teams. Fresh baked bread and homemade jam. Darn. There goes the diet. I’m organizing my volunteer time so that I go in to the school ONE day a week, help for an hour in the 5th grade classroom, then go and help for an hour to an hour and a half in the kindergarten classroom. The 3rd grade teacher/room mom hasn’t asked for my help yet, but hopefully if she does, I can make it work on Thursday. As I was correcting spelling booklets, I realized that 5th graders do NOT have the best handwriting. Some of those kids probably know how to spell the words, but their handwriting is so bad, they almost got the words marked wrong. I laughed to myself while the teacher taught them about identifying the simple subject and predicate, and wondered why some of these kids still don’t get it. One girl spent more time combing her hair than listening to the teacher. Oh, WHY didn’t my super smart daughter stay in the accelerated class? I’m afraid she’s going to be so bored in this regular class, after being in the accelerated class for the past two years. But she wanted to be back in the regular class so she’d see more of her friends. I hope we didn’t make a mistake. Down the hall in the kindergarten room, I find the kindergarten teacher VERY glad to have the help. Her army of volunteers haven’t started coming in to do centers and other such helping, and her student teacher was also gone. With 26 kids in there, she doesn’t even have time to escape and go to the bathroom unless someone comes in to help her. I was glad I was able to help her, even if it was only stuffing the homework folders and putting them into the kids’ boxes. Later, as I was getting into the car, I heard the Pleasant Grove bell tower playing a somewhat familiar tune. It took a minute to realize it was “Bicycle built for two”. I’m not crazy over the likes of you. I’m have crazy to go to the dance with you. to the Homecoming dance with you. I don’t remember who sang it, but they must have sung it in A’Capella, because I know we were in the choir room at the time. Isn’t that funny, what music can do? It can bring back a memory from 20 years ago, just from a song. Wow.